Loving the yarn with this pattern. But something nagged at me, what could it wrong? Oops. I don’t have enough yarn. D’oh! I really thought Jeanie only required one skein of Smooshy (nope, need 3!). Can’t believe I made such a silly mistake! Apparently, the lure of a new project was too strong for me to think rationally. 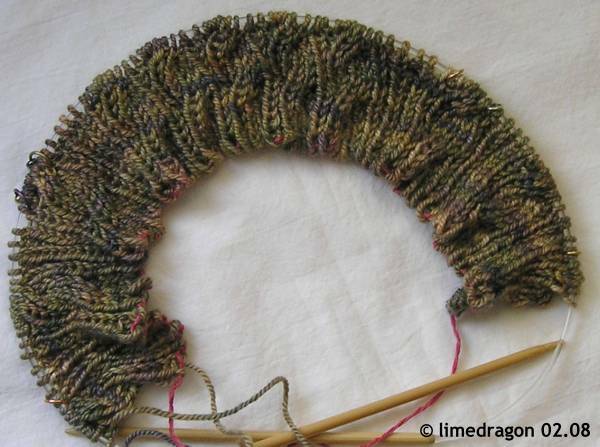 I WILL knit something lacy with the Omo, as large as yardage permits. It just may not be a rectangular stole as I had envisioned originally. I love the side bar design! Very cool! Oh pooh on the yardage!! But the yarn does look nice. Whoops… This is a great theme!! Great new blog theme! Great yarn! Great pattern! I’m in love with the new blog look! But I’m so sorry you didn’t have enough Smooshy for Jeanie. I hope you find something suitable for that gorgeous yarn. Sorry about the sock. Great to see the fresh new look of the blog. Very lighthearted and airy. I like it very much. The new design is so cute! I love it.